Turkey confirmed reports Wednesday that it is deploying troops, including fighter jets and anti-aircraft guns, along its border with Syria. “I can confirm there are troops being deployed along the border in Hatay province. 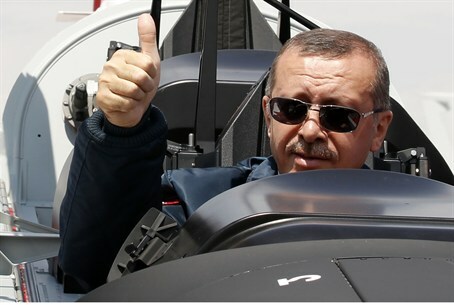 Turkey is taking precautions after its jet was shot down,” an official told reporters on condition of anonymity. The troop deployments come amid rising tensions between Ankara and Damascus following the downing of a Turkish F-4 Phantom jet by Syria over the Mediterranean last week. The Turkish official refused to comment on how many troops and vehicles were being deployed, but said they were being stationed in the Yayladagi, Altinozu and Reyhanli border areas of Turkey’s southern Hatay province. He also confirmed anti-aircraft guns and combat aircraft were being stationed along the border. Meanwhile, Turkish prime minister Recep Tayyip Erdogan on Tuesday accused Syria of a “hostile act” and “heinous attack” in shooting down the army jet in international airspace without warning. Turkey was totally in the right over Syria’s “downing of an unarmed reconnaissance jet in international air space” last week, Erdogan said in a speech to his ruling AK Party deputies in parliament. Erdogan also said the Turkish Armed Forces’ rules of engagement have changed and they will respond to any violation on the Syrian border. However, Erdogan said, Turkey would not engage in war-mongering at the same time said the downing of his nation's jet would not be left unanswered. A Syrian official speaking on condition of anonymity on Wednesday said it was possible the military mistook the Turkish jet for an Israeli one of the same type. However, the Israeli Air Force phased out its last F-4 Phantom jet in 2004. The downing of the jet has brought sinking relations between the former allies to a nadir. Turkey has repeatedly called on Syrian President Bashar Assad to step down as 33,000 Syrians have sought refuge from the bloodletting in Syria in Turkey. UN officials say Assad's brutal repression of a now-16 month popular uprising has left at least 10,000 people – most of them civilians – dead. Diplomats, however, say the actual number of Syrians killed in the ongoing unrest is likely much higher.